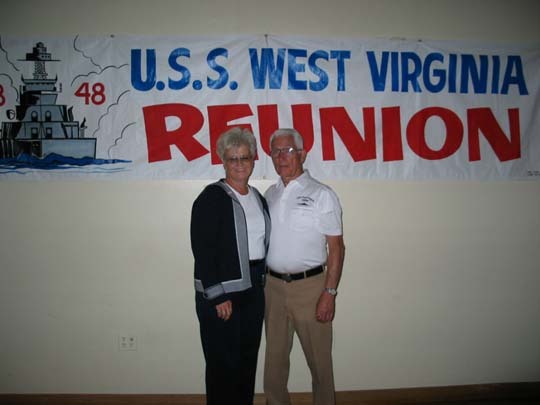 Joseph Variot is currently the chairman of the USS West Virginia Reunion Association. I would first like to introduce myself to those who may not know me. My name is Joseph D. Variot (Joe). I served in the 5th Division. My post was mount 3 secondary battery 5"-38. I never while serving on the Wee Vee amounted to much more than a swab jockey and had moved all the way up to Seaman first class. I had entered the Navy under the name of Carl W. Newton. Reason: I had just turned 16 and was too young to be accepted. This was my third try at enlisting in the Navy in a period of about eighteen months. Newton just turned 18 and did not want to be drafted. He let me use his identification, birth certificate, drivers license and etc. and it worked. Guess what? Four months later he was drafted. I was discharged in 1946 and re-upped regular Navy shortly afterwards. I served for about nine years total when I decided I needed more money to carry on. I could really never get the Navy out of my system, and about four years ago inquired into the U. S. Naval Sea Cadet Corps. Shortly afterwards, I was asked to start a new unit in Northern Michigan. I did so, and named it Michigan Mountaineers. We put together a flag using a broadside view of the West Virginia. Since our start we have moved up to about 55 cadets and 11 officers and instructors. It's really a satisfying contribution of time.